I am pleased to announce that I am the Grindell’s Hut Artist in Residence for 2018. Run through Country Arts SA, and in partnership with the Department for Environment and Water and the Vulkathunha‐Gammon National Park’s Co-Management Board, Natural Resources SA Arid Lands, the 3 week residency will involve extended movement through and interaction with the natural and cultural topography of the Flinders Ranges. Grindell's Hut, located on a remote hillside in the middle of the Vulkathunha‐Gammon Ranges National Park, approximately 365 kms north of Port Augusta, will serve as a base for an immersion in and exploration of landmark features such as the valleys and foothills of the Illinawortina Pound, and the majesty of the Blue Range. The Grindell’s Hut residency offers incredible scope to extend my investigations into how people move through natural environments, providing the opportunity to record, through direct sketches and abstracted pictorial notation, the ways in which topographical features influence walking patterns and visual reading paths. The residency will also include interactions with the traditional owners and co-managers of the Vulkathunha‐Gammon Ranges National Park, the Adnyamathanha people, who continue to have strong ties with their country, ancestors, law and culture. In addition, I will deliver artist workshops in Port Augusta on Monday 8th October, and in Copely on 12th & 19th October. 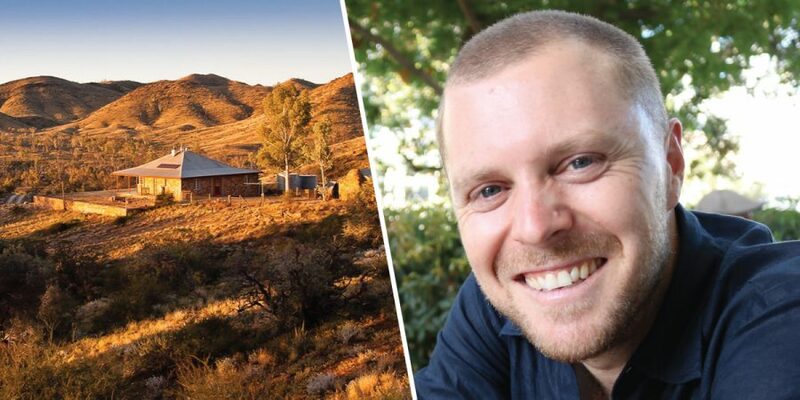 I am extremely excited to begin the Grindell's Hut Artist Residency 2018 on Monday 1st October, and would like to thank Samantha Yates and the entire team at Country Arts SA for this unique opportunity. I am pleased to announce that the large-format painting, 365:4 (Storm Coming), is a finalist in this year's 'The Churchie' National Emerging Art Prize. A neo-Cubist work first exhibited at Western Plains Cultural Centre (2017), 365:4 engages with the increasingly altered weather patterns of an era marked by accelerated climate change. The exhibition, held at Brisbane's QUT Art Museum, features work from 35 emerging artists from across Australia (including Rebecca Selleck and Kelly Austin, also pictured), whose practice spans a diverse and exciting range of contemporary subject matter and media. 'The Churchie' National Emerging Art Prize runs from 8th September - 4th November. 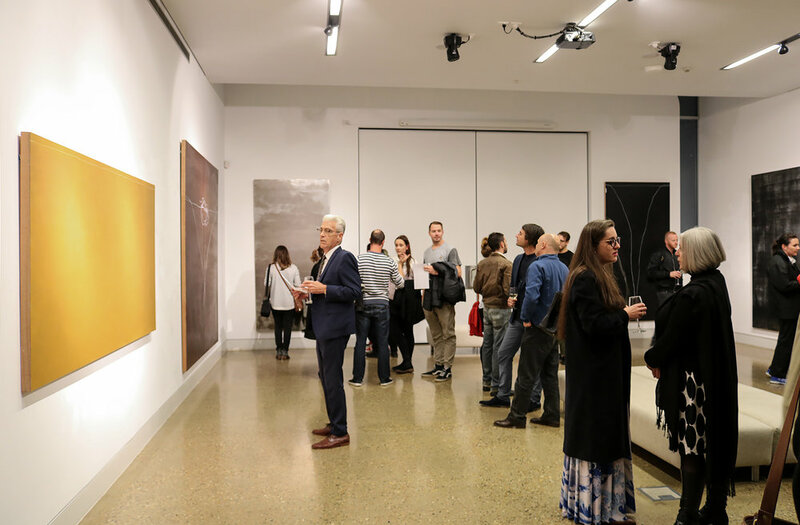 Thank you to all who attended the opening of Gregory Carosi: Expanse at Gallery 43 on Wednesday 23rd May, 2018. The exhibition, opened by Mr Stephen Payne (manager, Wagga Wagga Art Gallery), brings together a selection of large-format abstract paintings inspired by the landscapes and weather patterns of the Riverina. The paintings, drawn from two recent bodies of work - 365 and Axis - engage audiences in a consideration of the complex relationships between humans and the places they inhabit. Expanse runs until Friday 8th June. The main space at Wagga Wagga Art Gallery will play host to a major solo exhibition in 2020. Gregory Carosi: Dead Reckoning will respond to the site-specific qualities of the building to examine the relationship between pictorial and architectural space. The exhibition will explore the ways in which visitors move through a gallery in response to the nature of the works on display. Informed by the power and beauty of the gallery itself, Dead Reckoning will take up the challenge of harmonising the variations in scale defined by its high- and low-ceilinged interiors, doing so in visually dynamic ways that will foreground the power of art and art galleries to offer local and national audiences an all-encompassing experience that oscillates between intimacy and grandeur. 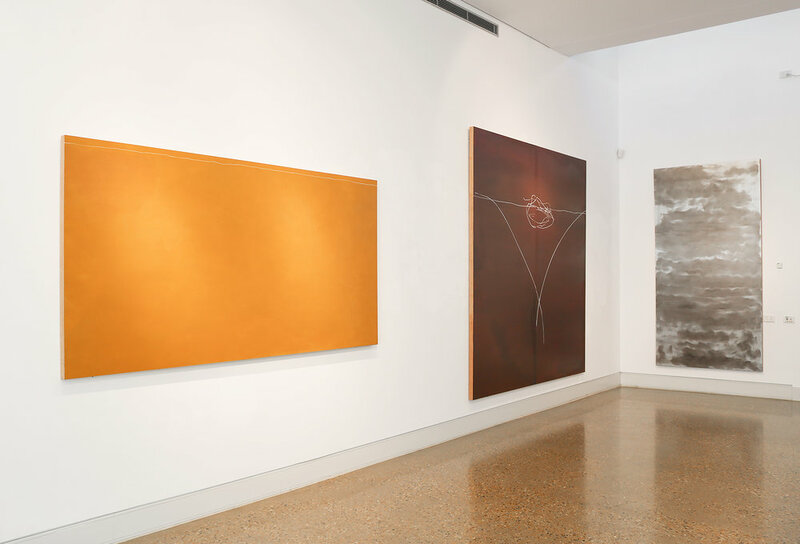 Opposite: Installation view, Griffith Regional Art Gallery, 2017. 'Axis 13' has been selected as a finalist in the 2017 Calleen Art Award, at Cowra Reginal Art Gallery. Judged by Director of the National Portrait Gallery, Mr Angus Trumble, the winner receives $20, 000. 'Axis 13' and other finalists will be on display at Cowra Regional Art Gallery from 7th May - 18th June, 2017. Official opening and announcement of award winners, Saturday 6th May. 621 appears in Wagga Wagga Art Gallery's New Acquisitions exhibition after the gallery purchased the work for their permanant collection in 2016. The exhibition runs through February and March 2017. The painting (oil on wood panel, 1200 mm diameter) sits alongside works by artists including Lin Onus and G.W. Bot. During February 2016, Untitled (oil on linen, 1000mm x 1000 mm) was exhibited in the Window Gallery at Eastern Riverina Arts. The work, completed in Sydney before the artist's relocation to Wagga Wagga, marked the thematic and formal starting point for the exhibition From There to Here at Wagga Wagga Art Gallery in April-June, 2016.